In New Hampshire, real property can be transferred from one party to another by executing a grant deed. A standard grant deed conveys an interest in real property to the named grantee with covenants that the title is free of any encumbrances (except for those disclosed in the deed) and that the grantor holds an interest in the property and is free to convey it. 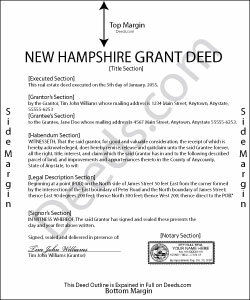 Grant deeds are valid, but not statutory in New Hampshire, and the form of the instrument of transfer must specifically state these covenants. A lawful grant deed includes the grantor's full name, mailing address, and marital status, and the grantee's full name, mailing address, marital status, and vesting. Vesting describes how the grantee holds title to the property. Generally, real property is owned in either sole ownership or in co-ownership. For New Hampshire residential property, the primary methods for holding title in co-ownership are tenancy in common and joint tenancy. A grant of ownership of real estate to two or more persons is presumed to create a tenancy in common, unless a joint tenancy is expressly stated (RSA 477:18). As with any conveyance of realty, a grant deed requires a complete legal description of the parcel. Recite the prior deed reference to maintain a clear chain of title, and detail any restrictions associated with the property. Include a spousal waiver of interest under RSA 148:5-a, if applicable. The deed must meet all state and county standards of form and content for recorded documents. Sign the deed in the presence of a notary public or other authorized official. For a valid transfer, record the deed at the recording office in the county where the property is located. Contact the same office to confirm accepted forms of payment. Both seller and buyer must file a Real Estate Transfer Tax Declaration of Consideration (RSA 78-B:1). Contact the local assessor's office to determine the appropriate version of the form. The grantee must file an original Form PA-34, Inventory of Property Transfer, with the Department of Revenue Administration within 30 days of recording of the deed, and also file a copy of the PA-34 with the local assessing official of the municipality where the property is located (RSA 74:18). This article is provided for informational purposes only and is not a substitute for legal advice. Contact an attorney with questions about using grant deeds, or for any other issues related to transfers of real property in New Hampshire. Richard V. said: It was very easy to get the documents which I needed. Richard T. said: This was a complete set of the necessary forms, with instructions. It will be very useful. Instant download was great. Reply from Staff: We appreciate your feedback Richard. Have a wonderful day! Jeramy A. said: Excellent source of information and forms. Deeds.com had exactly what I've been looking for and even had guides to filling out the forms. Susan T. said: This was perfect for my county I will be recommending your forms to all my clients thank you. Reply from Staff: Thank you Susan, have a great day!